Thank you all so much for your kindness following the passing of Ambassador Wolf Atka. While he leaves an enormous hole in our family, it is heartwarming to know that his spirit lives on in so many. Thousands of people from all over the world have reached out to us. You shared comforting words, heartfelt memories, artwork, poems, and flowers. To see over four hundred local friends at Atka’s open house memorial meant so much to us, and we know Atka would have enjoyed seeing you there too. Atka worked to create a better world for wolves, and so will we. 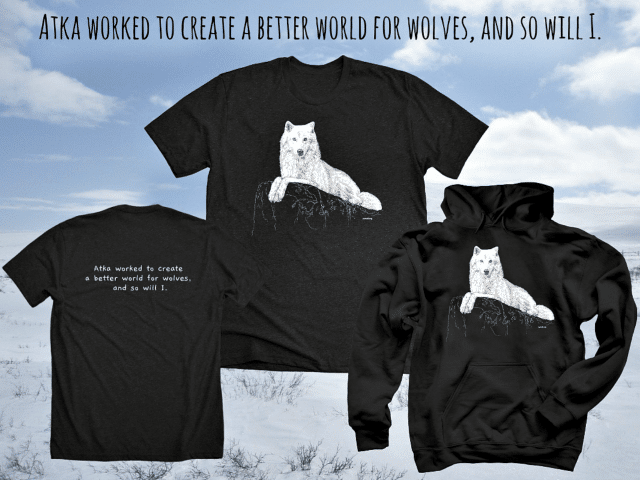 Help us celebrate him with your purchase of apparel from our limited edition ‘Guardian Spirit’ collection featuring a hand-drawn image of Atka himself by artist Jane Lee McCracken.